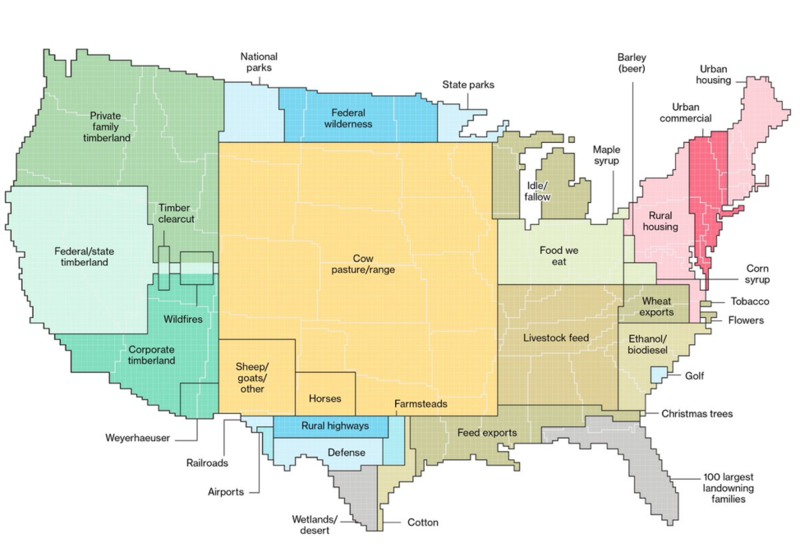 A recent Bloomberg article (Here’s How America Uses Its Land) broke down how the United States is carving up the 1.9 billion-acre land mass of 48 contiguous states into a collage of cities, farms, forests, and pastures that we use to feed ourselves, and create value for business and recreational use. But noticeably missing was the footprint from energy. This is surprising given that our every move is utterly dependent upon inexpensive and abundant energy. Without it, today’s society would grind to a halt. This is particularly true in the U.S. where the per-person oil, coal, and natural gas consumption is the most of any country, accounting for 21 percent of the world’s energy production. 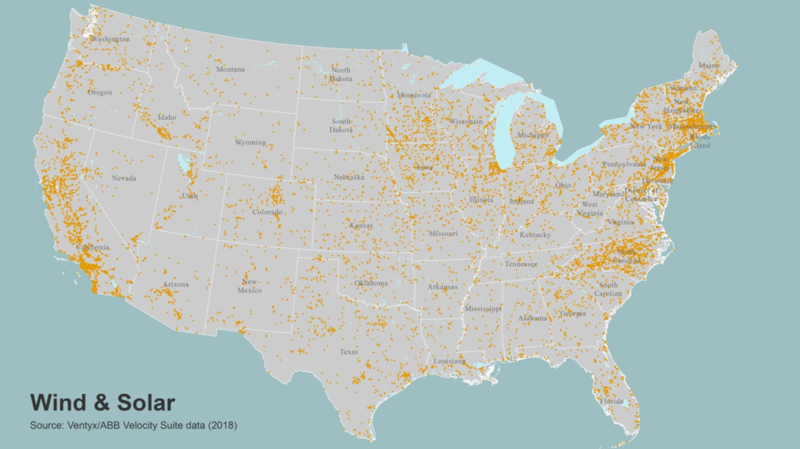 Since 2010, the United States has been in an energy boom. In 2017, domestic production was at near-record levels—we now produce more petroleum products than any other country in the world—with approximately 1 million active oil and gas wells. We’re familiar with oil-rich regions of Texas, but technological advances (e.g., horizontal drilling, hydraulic fracturing) have created a means of extracting these resources in new regions of the country, injecting billions of dollars into local economies and spurring a modern-day gold rush. At the same time that the United States is experiencing an oil and gas boom, market forces are transforming U.S. energy systems toward clean, renewable energy that was once a vision touted mostly by environmentalists. Now these energy resources are shared by market purists. Today, renewable energy resources, such as wind and solar power, are at price points that are, literally, driving coal production and coal-fired generation out of business. The U.S. solar industry has installed 2.5 gigawatts photovoltaic (PV) capacity in the first three months of 2018—resulting in 55.9 gigawatts of total installed capacity, or enough to power 10.7 million American homes. Wind energy is one of the fastest growing forms of electricity generation in the United States, and according to information from the American Wind Energy Association, wind energy now supplies more than 30 percent of the electricity in four states—Iowa, Kansas, Oklahoma, and South Dakota. With greater than 52,000 utility-scale wind turbines installed in the United States the wind capacity through the end of 2017 was roughly 85 GW—enough to power roughly 25 million average U.S. homes. And, while natural gas, wind, and solar have usurped coal’s dominance on electricity generation according to the U.S. Energy Information Administration, there were still 853 coal mines in the U.S. in 2015, producing a total of 896,941 thousand short tons of coal. Once electricity is generated, no matter its source, we have to move it from where it is created to where people plug in their televisions, computers, and other gadgets. 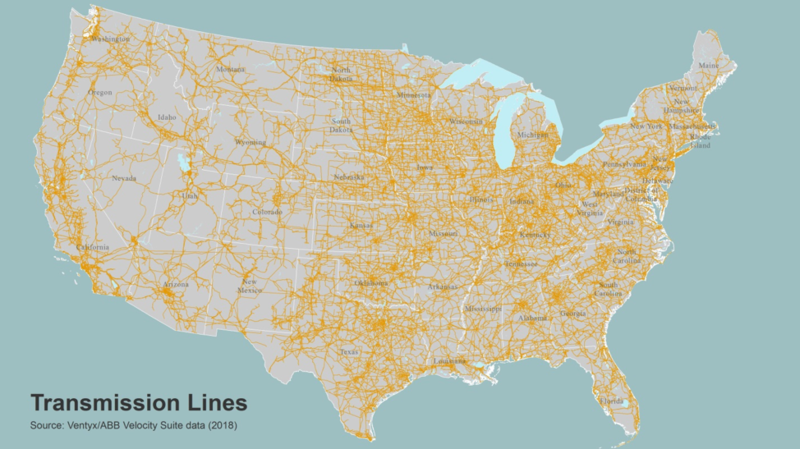 The U.S. electrical grid is the largest interconnected machine on Earth: 200,000 miles of high-voltage transmission lines and 5.5 million miles of local distribution lines, linking thousands of generating plants to factories, homes, and businesses—enough wire to spool around the earth’s equator 200+ times. The same is true for any oil or natural gas that is produced; we have to move it from where it is extracted to where it will be used. The United States also has 2.4 million miles of pipelines, the largest such network in the world. Energy production in the U.S. is predicted to rise 27 percent by 2040. 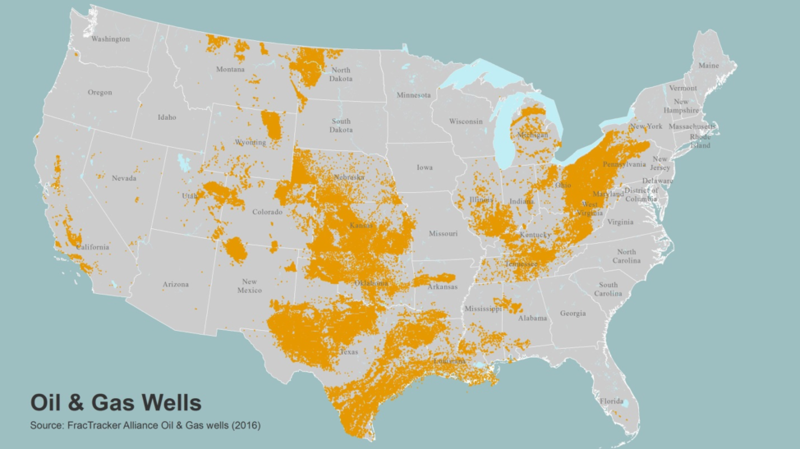 Projections of energy sprawl (land required for energy production) in the United States suggests over 200,000 km2 of additional land area will be directly impacted by energy development. When spacing requirements are included, more than 800,000 km2 (an area greater than the size of Texas) of additional land will be affected. This pace of conversion is higher than projections for future land use change from agriculture— identified as the largest driver of conversion by the Bloomberg map. Many of these shifts are positive as renewables continue to become a larger portion of the energy mix. Total installed U.S. PV capacity is expected to more than double over the next five years, and by 2023, over 14 GW of PV capacity will be installed annually. Making this new footprint fit will require tradeoffs with current land uses. In some cases these will be straightforward—wind for example fits well into areas classified as pasture/range or other agricultural areas. Solar certainly fits well on the roofs of urban housing or commercial areas. But not all choices will be so clear. The twentieth century more than any other time in history is marked by dramatic changes, all of them closely connected with dramatic increases in energy usage. And people have benefited greatly from this transformation—resulting in longer life spans and higher standards of living. We’ve harnessed energy into revolutions in food production (mechanization and fertilizers), expansion of transportation (e.g., cars, air travel) to even more rapid transformation of communication (TV, satellites, the internet). I like these things! While I love to camp and sleep on the ground, I also love to go home take a hot shower, check my email, and enjoy a cold beer! To be sure, there’s no doubt that we all could use less energy and be more efficient with what we do use. Given the human benefits powered by energy development, though, continued energy expansion is inevitable. And still, society remains largely uninformed about the consequences of such an escalation and, worse yet, many environmental groups still champion a romantic but increasingly unrealistic notion that everything can be conserved without difficult tradeoffs. Embracing that reality leads to the realization that there is dire need for a better approach to planning energy development to conserve biodiversity, clean water and other ecosystem services so valued by society. This is equally a call to the conservation community to engage with industry to help jointly envision that future footprint. Nowhere is this issue more acute than the greater Big Bend region’s Trans-Pecos area of West Texas where, according to the Bureau of Economic Geology at the University of Texas at Austin, the area is the most energy-intensive geographic region in the United States. At the same time, energy development is projected to expand into what may be the most biologically diverse desert system in the world. It’s in an expanse that consists largely of rural communities and privately owned ranch land. Finding solutions that balance energy development with the needs of biodiversity, and the open spaces that define the culture of the area will be a challenge. The key to this challenge is proactive landscape planning that is undertaken across geographies and across multiple energy sectors. This type of planning changes the old story of development by inverting the timing and scale at which biodiversity and other values are considered by industry. By proactively considering potential impacts of projects before they have been individually planned and move toward implementation, we can preemptively identify disputes and solutions that mitigate impacts before they become conflicts. The cumulative impact of development can be mitigated when numerous individual projects are planned collectively to avoid, reduce, and then compensate residual impact. Comprehensive rather than piece-meal planning results in more effective conservation outcomes, reduces regulatory hurdles for industry, and offers cost savings to conservation interests and industry alike. For this region of West Texas the question is not if this area should be developed; instead, the question is how the area can be developed in a way that protects its biodiversity, communities, and landowners for the long-term. Joseph Kiesecker is Lead Scientist for The Nature Conservancy’s Conservation Lands Team. In this capacity his main responsibilities include developing new tools, methods, and techniques that improve conservation. He pioneered a design strategy that improves impact mitigation through the incorporation of predictive modeling to provide solutions that benefits conservation goals and development. He has held faculty appointments at Yale University, Penn State University and currently holds a faculty appointment at the University of Wyoming. He has been a Donnelly Fellow, and has received funding for his research from National Institutes of Health, the National Science Foundation, the IUCN and numerous private foundations. Kiesecker has published over 100 articles, on topics ranging from climate change to the effectiveness of conservation strategies. Joe has a Ph.D. from Oregon State University.